Is it Safe to Use Teeth Whitening Kits When You are Pregnant? Teeth whitening products are something that more and more people are starting to use in a bid to preserve their beautiful, pearly-white smiles. 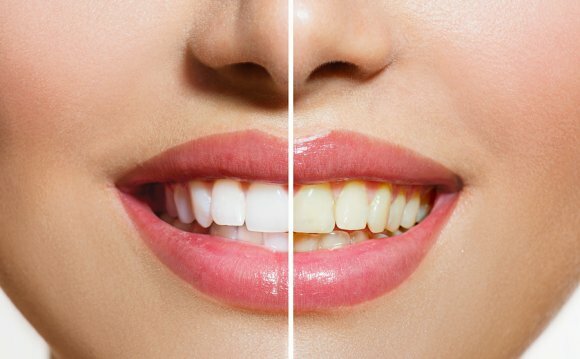 Most people have slightly yellow enamel – this is not unhealthy. However, teeth should be more white than yellow, and if they start looking discoloured because of exposure to coffee, wine, spicy foods or anything else, then this is something that you would want to treat with a teeth whitening product. Dentist-based teeth whitening treatments are usually safe for most people, but at-home teeth whitening kits can be risky, especially if you do not know how to use them properly. Pregnant women are advised to avoid using teeth whitening products at all, because there has not been a lot of research done onto whether carbomide peroxide or the other ingredients in teeth whitening kits are safe for the mother and baby. Most dentists will refuse to carry out teeth whitening procedures on women who are pregnant or breast feeding, because of the potential risk to the health of the child. There are some beauty salons that will offer teeth whitening treatments, but these are best avoided, because it is not legal (in many states) for such procedures to be carried out by anyone who is not a licensed dentist. Over the counter treatments are widely available, but these contain powerful bleaching agents which have the potential to irritate your gums, as well as to damage the enamel of the tooth, which could actually make the problem worse in the long term by making the enamel more porous, and therefore more likely to accept stains. The one thing that it is widely considered safe for all people to use is whitening toothpaste. This is something that tends to just reduce stains, rather than actually whitening the enamel itself. Because it is milder, and also has the added effect of also protecting the teeth, it is a good idea to use it on a regular basis. If you have concerns about the health of your teeth, note that you don’t have to use teeth whitening products all the time. There are many other things that you can do to keep your smile looking great. Remember to brush and floss regularly, and try to brush your teeth after meals, especially if you eat something with spices or that is otherwise likely to stain your teeth. Try to eat some cheese at the end of a meal (the alkaline nature of the cheese will help to reduce the acidity of your saliva), and drink lots of water. Be mindful of how many acidic drinks you consume, and be sure to either brush your teeth or chew sugar free gum after drinking something that will stain your teeth.